To understand the consequences of the petrodollar’s demise, it is necessary to remember that the impetus for the creation of the petrodollar system was not strictly economic – it was also strategic. The Middle East was one of the main areas of competition between the Soviet Union and the United States during the Cold War. The U.S. wanted to ensure that it would always have access to the oil produced by OPEC countries, which at the time accounted for more than half of total oil production. To do so, Washington offered Saudi Arabia and other Gulf oil producers weapons and protection. In exchange, they agreed to accept the dollar exclusively for oil sales and to invest their revenue into U.S. Treasuries. The economics benefited both sides, but Cold War strategic challenges were just as important, if not more so. All of this has since changed. OPEC now produces only about 40 percent of the world’s oil, and the days when it could dictate global oil prices are over. The U.S. is one of the key reasons: It has surpassed Saudi Arabia in both recoverable oil reserves and total hydrocarbon production, and U.S. shale production has put a ceiling on the price of oil. In addition, the U.S. has become a significant oil exporter, increasing exports by a factor of 20 in the past four years, which means the U.S. has gone from major consumer of Saudi oil to competitor practically overnight. In 1977, the U.S. imported 1.38 million barrels of oil per day from Saudi Arabia. In 2012, that figure had not changed much – just under 1.37 million bpd. Since then, U.S. oil imports from Saudi Arabia have fallen by 30 percent to 949,000 bpd. Saudi Arabia’s strategic importance to the U.S. has also slipped. U.S. involvement in the Middle East is no longer about collecting allies to oppose Soviet acolytes. What the U.S. needs more than anything in the Middle East are partners strong enough to manage the region’s chaos without running to Washington for help every time the Houthis fire a missile or the Iranians develop a new proxy. The U.S. has also not forgotten Saudi Arabia’s use of radical Islamist proxies and the Saudis’ involvement in the spread of radical Islamist ideologies, which played a major role in the formation of groups such as al-Qaida and the Islamic State. The U.S., which has been trying to extricate itself from its wars in the Muslim world for 17 years, now faces an aggressive Iran and a defiantly independent Turkey, and its Saudi ally has been no help. While the U.S. is weaning itself off foreign oil, China is growing more dependent. This does not come without certain benefits for Beijing. The U.S. is a prime example of the power consumers hold over producers, especially in a world where most countries export more than they can use. But unlike the U.S., China does not have the benefit of being able to access the world’s oceans at will. Also unlike the U.S., China cannot offer a country like Saudi Arabia much in the way of security or protection. And even as the yuan’s usage increases, countries will still value the dollar over all currencies for reasons that have nothing to do with what currency China uses to pay its oil suppliers. The dollar was established as the world’s reserve currency at the 1944 Bretton Woods Conference. It is true that the rise of the petrodollar helped the dollar maintain this position in the 1970s after President Richard Nixon took steps that led to taking the U.S. off the gold standard. But just because there was once a direct link between the dollar’s position as a global reserve currency and the petrodollar system does not mean the link is still definitive. This is not to say the decline of the petrodollar system will be without consequence. The quantity of dollars abroad matters, and since the U.S. will be buying less oil, there will be fewer dollars abroad. But the dollar will retain its position as the global reserve currency as long as it is seen as the safest and most reliable currency one can hold, and there is little reason to think global confidence in the dollar is waning simply because the U.S. is buying less foreign oil. Confidence can be tricky to quantify, but global preference for the dollar is not abstract. The latest data from the International Monetary Fund shows that in the third quarter of 2017, 54 percent of official foreign exchange reserves were held in U.S. dollars. That was an increase of 13 percent over the previous year, which means the U.S. position is not only dominant – it is increasing. By comparison, just 1 percent of foreign exchange reserves were held in Chinese renminbi in the third quarter. The Bank for International Settlements, which produces a survey of foreign exchange turnover every three years, revealed in its latest edition in December 2016 that the yuan was used in 4 percent of foreign exchange transactions in 2016, just barely more than that of the Mexican peso. By comparison, the U.S. dollar was used in 88 percent of foreign exchange transactions. China can certainly strong-arm countries into using yuan to increase its global usage. But being able to force countries like Saudi Arabia or Venezuela to use yuan is very different from countries choosing to use the yuan because it is preferable to the alternatives. To vie for global reserve currency status, China does not need an oil futures market – it needs to prove it can carry out transparent monetary policy, refrain from routinely manipulating the yuan’s value and lift capital controls. China is light-years from all three. What China can do with this move is increase the use of the yuan in the world. Ironically, as China does this, it will become more dependent on the Middle East and on maritime trade routes to get there, just as the U.S. is becoming less dependent on the same. This will increase China’s need to develop power-projection capabilities and may bring it into conflict with the prevailing world order. In the meantime, as long as Saudis and speculators are the only ones taking yuan, the dollar’s position as global reserve currency should be safe. 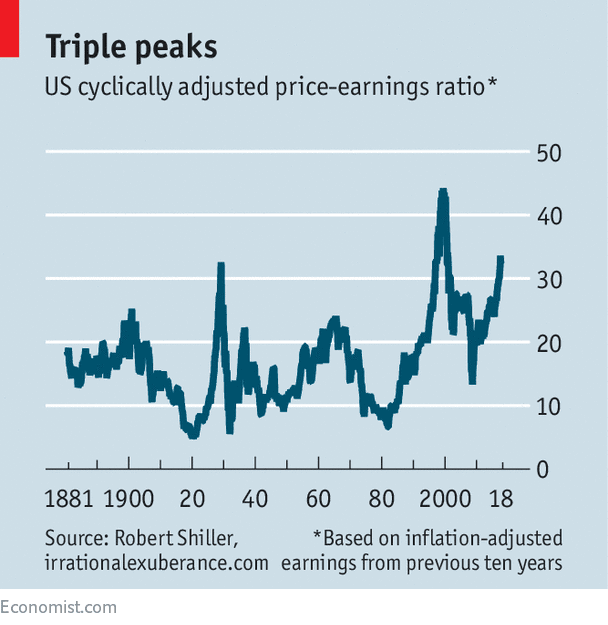 FEW measures of stockmarket valuation are as controversial as the cyclically adjusted price-earnings ratio, or CAPE. American equities have looked expensive on this measure for most of the past 20 years, which is why many bulls tend to dismiss its usefulness. It is pretty clear that the CAPE does not help investors to time the market. But a new paper* from Research Affiliates, a fund-management group, explains why many criticisms are overblown. The strongest case for the measure is that a higher ratio tends to be associated with lower long-term returns. A study of 12 national markets shows that a 5% increase in the CAPE, from 20 to 21, say, tends on average to reduce the total ten-year expected return by four percentage points. The attraction of the CAPE is that it smooths out the vicissitudes of the profit cycle. In a recession, profits can plunge even faster than share prices. So if you look only at the ratio of a share price and the previous year’s profits, the market can look very expensive. Since it is a moving average of profits over ten years, the CAPE is less volatile. Past peaks have coincided with the top of bull markets, as in 1929 and 2000 (see chart). It is now well above its long-term average. Critics say that the high value of the CAPE can be easily explained. One argument is that profits have shifted to a permanently higher level. Accounting standards have changed and modern companies, such as Google and Facebook, have more market power. Another line of argument is that, regardless of the level of profits, valuations should be higher. Demographic changes mean that baby-boomers are piling into equities as they prepare to retire. Low real interest rates mean future profits, when discounted, are worth more today. General economic and financial risks have fallen. The paper tries to tackle those arguments. The authors accept that the current level of profits is high. But they do not believe that this means future profits growth will necessarily be strong. There is a tendency to revert to the mean. Historically, rapid growth in profits over a ten-year period is associated with slower growth over the next decade. Furthermore, the high level of profits is linked to slow growth in wages. That has led to a populist backlash, which could result in higher taxes on companies or restrictions on trade. The demographic argument also has its flaws. The baby-boomers are already in the process of retiring, which means they will be running down their savings pots rather than building them up. Furthermore, the ageing population means that the workforce will grow more slowly in future. Other things being equal, that will be bad for both economic growth and profits. As for the impact of low interest rates, a lot depends on why rates are low. If they are depressed because central banks expect slow economic growth, that is not great for equities. Arguments based on low macroeconomic volatility tend to be hostages to fortune; there was much talk of the “great moderation” in the early 2000s, just before the financial crisis hit. Finally, other countries also have low interest rates, reduced volatility and ageing populations, without their markets trading on anything like the CAPE that Wall Street does. America’s ratio is 32.8, whereas Canada is trading on a CAPE of 20. Germany is on 19 and Britain on 14. All are trading near their historical averages; in contrast, Wall Street is at double its usual level. America may have more powerful companies, but that is a very large gap to attribute to a single factor. Alternative measures of stockmarket valuation, which compare share prices with corporate sales or asset values, also show that Wall Street looks expensive, relative to history, but that other countries (particularly emerging markets) look cheap. Plenty of sceptics will fail to be convinced by this reasoning. They will point out that the American CAPE has been consistently over 20 since 2011, well above its historic average of 16.8. Yet the markets have continued to perform well, admittedly helped by a huge amount of stimulus from the central Banks. But they should consider what their optimism implies for the future. American pension funds are expecting returns of 7-8% from their portfolios. That would require some combination of decent economic growth, continued low interest rates, a bigger share of profits in GDP and even higher valuations. If you believe in all that, this columnist has some crypto-currencies he would like to sell you. On March 11, China’s 3,000-strong rubber stamp legislature, the National People’s Congress, voted to remove constitutional term limits on the presidency, setting the table for Xi Jinping to stay in power indefinitely beyond 2022. Only two lawmakers voted against the move. On March 17, the congress approved the biggest overhaul of the government in decades, including the removal of eight ministries and seven agencies. Several other state entities, including some long seen as largely untouchable, saw their powers dramatically reduced. These aren’t just cosmetic changes. Rather, they will have substantive implications for the ability of Xi and his lieutenants to transform the bureaucracy from something Chinese leaders have spent inordinate amounts of time fighting into something he can use to implement his grand plans for China’s future. More than anything, they dramatically tighten the Communist Party’s control over the state, further undoing the very system that helped facilitate China’s rise. In other words, if China’s epochal 19th Party Congress in October was where Xi was crowned emperor, the National People’s Congress was where Xi made clear the extent of his rule over the realm. And just as Xi’s lifting of term limits signaled to his rivals that they cannot merely wait him out, it also signaled to China’s vast and unwieldy bureaucracy that it cannot stall the sweeping changes coming down the pike. China is doing this because it has to. The magnitude of the economic and social challenges the country is facing leave little room for the bloat, inefficiency and pervasive corruption of the governing structure Xi inherited. So Xi is striking while the iron is hot – for the time being, Xi’s grip on power is unquestioned and the Chinese economy, thanks in large part to strong global growth, is relatively stable – to take on deeply entrenched pathologies he thinks are standing in the way of his plans to ensure that China doesn’t fall back into its historical swings between centralization and disintegration. But there’s no guarantee his grip on power will last, and economic conditions certainly won’t always be working in his favor, keeping open the question whether the sorts of changes introduced at the congress will be enough to stave off a reckoning. In 1987, China’s then-Paramount Leader Deng Xiaoping pushed through sweeping reforms intended to extricate the party from most matters of day-to-day governance. Over the previous five years, Deng had been gradually relaxing the Communist Party’s control over the economy, unlocking much of the market-driven dynamism that would fuel China’s breakneck growth over the coming quarter century – but he believed this effort needed to go further. Memories of Mao’s impulsive and chaotic reign were fresh, and in Deng’s view, China needed a technocratic and largely apolitical government to fully modernize. The party’s role would be confined to setting broad policy goals and intervening only selectively to make pivotal decisions. Critically, decentralization was also seen as a way to keep the peace among rival factions by ensuring each a slice of the growing pie. The result was a peculiar structure of parallel hierarchies between the party, the military and the government (known as the State Council). Party institutions have always been preeminent. But their state and military counterparts were generally allowed to function in ways they would in any other modern country, with considerable autonomy over policymaking and implementation. Over time, however, this structure bred a host of new problems. The era of newfound prosperity ushered in by Deng’s reforms also spawned pervasive corruption, crony capitalism, bureaucratic bloat, fuliginous power structures and conspicuous economic disparities, each of which threatened to undermine the party’s justification for single-party rule. It also allowed competing power centers to flourish, making the central government generally too weak to take on vested interests and implement much-needed reforms. This may have been fine had China continued on a course of seemingly permanent double-digit growth. But as has been made increasingly clear since the 2008 financial crisis, China is entering a prolonged period of, at minimum, slowing growth. With less pie to go around, the risk of paralyzing power struggles and the sort of socioeconomic unrest that could shake China to its core soars. This collective fear fueled Xi’s rise. At the congress, Xi’s top economic adviser described the problem in terms that, by the paint-drying standards of party communiques, were akin to shouting from the rooftops: “The overlapping of functions and responsibilities of some Party and State organs remains a prominent issue.” During his first term, Xi dealt with it primarily by either putting the fear of God into established institutions or bypassing them altogether. For example, through his sweeping anti-graft campaign, Xi replaced rivals with loyalists in key positions throughout the party and government, and rooted out resistance to his agenda. To outflank bureaucratic fiefdoms and even senior-level bodies like the Central Committee, Xi also stripped formal institutions of much of their policymaking power, instead relying on loosely defined committees known as central leading groups (most of which he established and chaired) to lay out the rules of the road. This is how even senior-most figures like Premier Li Keqiang, officially the head of the State Council and the No. 2 member of the Politburo Standing Committee, have routinely found themselves with little real decision-making power. This approach hardly seems sustainable. China is a massive place with a massive tangle of entrenched interests and enough moving parts to make micromanagement a fool’s errand. Xi and his inner circle have only so much bandwidth. Trying to control the Chinese government machinery too tightly raises the risk of losing control of it altogether. After all, Mao’s plans for the country went sideways when the cult of personality and culture of sycophancy he cultivated ultimately blinded him to the rot hollowing out the system from within. Eventually, Xi would need to wrangle the state into a shape that he could trust to operate in alignment with his agenda – and more easily detect when it strayed. Last week’s overhaul is a major part of that effort. Too many changes were introduced at the congress to cover comprehensively here. But combined, they can be viewed as intended to help address threats to five overarching (and largely overlapping) aspects of the administration: Xi’s power, his economic reform agenda, Chinese financial stability, public trust and Beijing’s ambitions abroad. During his first term, Xi succeeded – beyond anyone’s wildest expectations – in sidelining rivals and potential successors and destroying competing centers of power. Perhaps most impressive, he received at least reluctant backing to do so from party elders who were all too familiar with the pathologies of the Chinese system. But this by no means ensures Xi will remain secure indefinitely. There will inevitably be winners and losers with every reform. With each, gobs of money and power will be at stake. The risks of a destabilizing power struggle will only grow during times of heightened political-economic upheaval. And since discarding the Deng-era succession model has meant skipping over an entire generation of leaders who expected a shot at reaching the upper echelons of power, there are any number of potential rivals waiting to seize on Xi’s missteps to get their due. So one overriding goal of the recent overhauls is to weaken the ability of new rivals to gain traction as Xi takes China down the rocky road ahead. More than anything, this means making it harder for figures to use their positions in the government, bureaucracy or military – or perhaps even the private sector – to cultivate tight patronage relationships and develop independent bases of power. Making sure that folks who owe their careers to Xi more than anyone else are leading China’s most powerful institutions is one way to do this. So too is making sure the institutions headed by his people are imbued with clear authority over those that aren’t. Another way is to weaken powerful institutions themselves – a method Xi employed to tighten his grip over the People’s Liberation Army. This is a major motivating factor behind one of the most ambitious overhauls: downsizing the National Development and Reform Commission – a sprawling agency that has dominated economic planning since the Mao era. The NDRC was intended to function as the preeminent conductor of state-led growth, channeling state funding into industries and regions deemed both economically and politically important and shrinking disparities between China’s coasts and the interior. In practice, this meant it had authority over everything from state-backed infrastructure projects to electricity pricing to corporate bond markets, making it a bastion of corruption and positioning its officials to build out lucrative patronage networks. At the congress, the NDRC was stripped of a wide range of its powers, including creating development zones, directing agricultural investments and controlling healthcare pricing. It’s a testament to Xi’s power that he could even take on the behemoth. The NDRC, known as the “mini State Council,” is the sort of deeply entrenched institution that couldn’t be overhauled by a weaker Chinese leader. The biggest club in Xi’s bag will be the new National Supervisory Commission. During his first term, Xi relied most heavily on the Central Commission for Discipline Inspection to execute his sweeping anti-graft campaign and weaken all up-and-comers. To date, the CCDI has doled out a range of punishments to more than 1.5 million officials across all sectors of the party and the government and in state-owned firms, including low-level “flies” and senior-level “tigers.” (The probe has even netted nearly 8,000 anti-graft inspectors.) The CCDI, a party body, will now be combined with government anti-graft agencies to form the National Supervisory Commission, which is reportedly seeing its target set triple in size and staff increase by 10 percent. Investigations will no longer be limited to party cadres; anyone in the civil service or even the private sector will be fair game. Already, the CCDI had begun absorbing many of the government’s judicial functions; the NSC, headed by a Xi associate, will be formally placed above China’s judicial system in the hierarchy. It will be bigger, hold a broader mandate, and be more deeply embedded at all levels of the Chinese government. Effectively, the new watchdog will function as Xi’s eyes and ears – and in many ways his fist. And considering Xi’s ambitions to uproot even the most deeply entrenched problems in the Chinese system, it will surely be busy. A core reason why Xi was able to amass so much power in the first place was that something of a consensus emerged among party elders that a strongman was needed at the helm to prepare China for a crisis and respond decisively when it comes. So Xi is backed by a mandate to push through painful reforms – as well as a shared sense of urgency to do so while the Chinese economy still has the wind at its back. The problem for Xi is that the bureaucracy and local governments have proven exceedingly adept at looking after their own interests, particularly those that don’t align with those of Beijing. Resistance from further down in the ranks is inevitable. For example, Beijing wants to cool down overheating real estate markets and slim down unprofitable industrial sectors to deflate bubbles and debt risks that pose a systemic risk to the broader economy. But local governments rely overwhelmingly on development and real estate for their own funding, as well as on construction to maintain stable employment in their regions. For provincial and local leaders, stable employment and robust growth have long been keys to career advancement. For all parties involved, there are enormous incentives to skirt regulations and cook the books – a problem in China since the Mao era, including even for Xi. The structural changes introduced at the congress are also intended to pave the way for reforms in two primary ways. The first is by making it harder for state institutions – especially those seen as having become excessively cozy with local governments and industries – to act independently. The downsizing of the NDRC is illustrative here. The commission has often been accused of working at odds with Beijing’s broader economic and reform goals. For example, it’s been blamed for playing fast and loose with approvals for major infrastructure projects, as well as recklessly channeling excessive funding into unprofitable industrial sectors. This has contributed to the debt woes of local governments – which rely on infrastructure development for growth – as well as widespread industrial overcapacity. At times, the NDRC has directly undermined Beijing’s attempts to address systemic risks and introduce market mechanisms in these areas. These reforms remain priorities for Xi, so the NDRC had to be reined in. The NDRC’s focus will be narrowed primarily to macro-level industrial development, reducing its influence over individual projects and ability to work at cross purposes with Xi. The second is by strengthening Beijing’s oversight capacity at the provincial and local levels, as well as the enforcement capacities of regulators. Part of the problem in the past was that environmental and financial regulators, in particular, were unable to come down hard on cheating, allowing a culture of impunity to fester. Xi’s use of the CCDI began to change this, especially as inspectors took on a wider range of responsibilities, such as environmental inspections. The National Supervisory Commission will dramatically expand its presence, embedding units across the national, provincial, city and county levels to try to ensure adherence with contentious reforms. Meanwhile, the National Audit Office is being beefed up with new powers (including some previously held by the NDRC) to try to ensure all parts of the system aren’t falsifying data to give the appearance of compliance. The most urgent overhaul is focused on China’s $42 trillion banking and insurance sectors. This reflects the priority being placed on addressing financial risk – an issue that Xi elevated to the level of a national security threat last year, supported by ample evidence that China is highly vulnerable to a financial crisis. At the congress, Beijing took its most dramatic steps in a generation toward modernizing China’s sclerotic and overmatched financial regulatory system, which has been plagued by rigid siloing, chronic gaps in supervision and incentives to protect the institutions regulators are tasked with keeping in line. At the heart of the changes is the central bank, which is expanding beyond its traditional role as adviser on monetary policy to become China’s core policymaker on economic matters. Its new powers come at the expense of China’s top insurance and banking regulatory bodies, which are being merged and stripped of any major role in drafting new laws and rules for the finance sector. Alongside the consolidated banking and insurance regulator will be the China Securities Regulatory Commission, which appears to be surviving as a stand-alone entity, and the new Market Supervision Administration, which will have a range of oversight responsibilities, from food prices and safety to enforcement of competition laws. For the past two decades, China’s financial system has been overseen by separate banking, insurance and securities watchdogs, the jurisdiction of each tightly confined to its own sector. More recently, however, the lines between the sectors have become blurred. For example, banks and nontraditional lenders such as insurance companies have increasingly been competing in the “shadow banking” space through activities that have not fit neatly under the purview of any single agency. This allowed financial institutions to essentially shop around for favorable loopholes in regulations (a practice known as regulatory arbitrage) or operate free of oversight altogether. As a result, regulators have been locked in a losing game of whack-a-mole that has dramatically undermined Beijing’s efforts to deflate any number of alarming debt bubbles. The new system is designed to eliminate bureaucratic turf wars, gaps in oversight and conflicting regulations. The entire system, including the central bank, will be tightly overseen by the Financial Stability and Development Committee – a cabinet-level body established last year and headed by Xi’s top economic adviser, Vice Premier Liu He. Policymaking powers therefore will be controlled tightly at the top, with the FSDC setting broad guidelines, the central bank making them law, and the watchdogs focused solely on inspections and enforcement. Theoretically, at least, this new system will allow Xi’s writ to be felt more clearly down the line. Economic risk isn’t the only threat to the Communist Party’s legitimacy. Consider environmental regulation. As with most major challenges facing Beijing, China’s leaders are trapped between conflicting pressures here. Pollution is becoming a major political issue. (A recent University of Chicago study estimates that air pollution in China’s northern rust belt will reduce regional lifespans by an average of three years.) Xi has staked his political standing with the public, in part, on cleaning up the environment, and it is an area where the masses can more easily assess for themselves whether the regime is making tangible progress. At the same time, shutting down high-polluting firms or forcing firms to invest in expensive smog mitigation measures could cause a spike in unemployment that Beijing may not be able to stomach. As Xi consolidates authority under the central government, pollution is becoming a litmus test for Beijing’s ability to enforce its writ and maintain the precarious balance between political and economic priorities. Toward this end, the new Ecological Environment Ministry will be taking over functions currently divided among six other agencies, including the National Development and Reform Commission. Ostensibly, this will reduce regulatory arbitrage, as well as internal conflicts of interest in economy-focused agencies like the NDRC that often treated environmental issues as subordinate. As with all the overhauls introduced last week, it will also consolidate policymaking at the top and streamline enforcement. Moreover, as mentioned above, anti-graft investigators had already been playing bigger roles in cracking down on polluters. These efforts will be expanded through the National Supervisory Commission. The establishment of a more centralized Emergency Management Ministry – tasked with addressing threats ranging from natural disasters to workplace accidents – is motivated by another set of concerns. In China, accidents and disasters tend to expose symptoms of institutional rot such as corruption and lax enforcement of safety regulations, as well as doubts about the state’s ability to respond effectively. Take, for example, a series of colossal chemical explosions at the Port of Tianjin in 2015 that left 173 people dead and sprinkled the city with toxic rain for days. The blasts were believed to have been triggered by illegal storage of vast amounts of hazardous materials. The ensuing political backlash compelled Beijing to heavily censor coverage of the event, and police were reportedly ordered to under-report the death toll. Ultimately, some 49 government officials were jailed, and the owner of the company responsible for the incident was sentenced to death. Similarly, following the 2011 collision of two high-speed trains in Zhejiang province that killed 40 and exposed pervasive corruption in the rail industry, officials were pilloried for their slow rescue response and ham-fisted attempts to suppress coverage of the accident. For a government that claims that tight control over all aspects of Chinese society is in the public interest – and for a strongman who claims authoritarian leadership is needed to deliver on the Communist Party’s promises – failures to combat pollution or prevent or respond to disasters are not just an embarrassment, but also a threat to the party’s very legitimacy. The overhaul is also motivated by threats to Beijing’s ambitions abroad – ambitions driven by strategic and domestic concerns. For example, Xi brought his top lieutenant during his first term, former CCDI chief Wang Qishan, out of retirement to serve as vice president. The vice presidency has traditionally been a largely ceremonial post, but Xi is expected to lean on Wang to prevent U.S.-Chinese relations from devolving into a full-blown trade war that threatens Chinese economic stability. Other changes reflect China’s efforts to tamp down fears among the international community about how it will use its growing power. For example, China is consolidating control over foreign aid under the new International Development Cooperation Agency. The main idea is to ensure that aid provisions serve Beijing’s comprehensive strategic goals – increasingly important as China seeks to make the case abroad that its rise will also be beneficial to those it considers friends. Previously, the Foreign Affairs Ministry and the Commerce Ministry dispensed aid separately, creating some potential for tactical dissonance. The main vehicle here will be China’s Belt and Road initiative, a project that underscores the links between Beijing’s domestic and foreign objectives. Perhaps the most notable change related to China’s operations abroad is the establishment of the Veterans Affairs Ministry and accompanying moves to boost pay and pensions for the troops. To mold the People’s Liberation Army into a modern fighting force, clamp down on corruption in the ranks and tighten the party’s control over the senior brass, Xi has laid off some 300,000 troops since 2015 and replaced the PLA’s four former headquarters with 15 functional departments as a means of diffusing the powers held by each. Naturally, this generated significant friction among officers who’ve seen their career paths and (often lucrative) sources of patronage severed. It also sparked sporadic but alarming protests among veterans upset about issues such as unpaid pensions and lack of opportunities in recent years. The PLA is the ultimate guarantor of the party’s hold on power and, increasingly, the dominant tool at Beijing’s disposal for pursuing its strategic objectives abroad. There are 57 million retired military personnel in China, hundreds of thousands of whom may resent being included in that number. Xi isn’t taking any chances with allowing their grievances to fester. All of these threats overlap, and all point to the underlying problem facing China: It’s trapped between contradictory economic and political imperatives, and trade-offs cannot be wished away, no matter how efficient the government becomes under Xi. The latest overhaul shows both Xi’s extraordinary strength and his fears of impotence in the face of deeper currents moving against him. So China is preparing for a crisis. Whipping the government into alignment with the party and tightening his grip over both may make Xi and his government better equipped to stall the crisis, or perhaps even substantially weaken it. But crisis is baked into China’s DNA and cannot be avoided forever. Ultimately, whether this recent overhaul will make any difference depends on whether Xi will remain strong enough, with tight enough control over the Chinese machinery, to keep China’s inherent fault lines from rupturing when the crisis comes. The world’s poorest countries are increasing their borrowing at a worrying pace and face the mounting risk of debt crises, the IMF has warned. Since 2013, the median ratio of public debt to gross domestic product in low-income countries has risen 13 percentage points to hit 47 per cent in 2017, according to new research by the IMF. The research found that 40 per cent of low-income developing countries face “significant debt-related challenges”, up from 21 per cent just five years ago. Fiscal deficits rose between 2013 and 2017 in nearly three-quarters of the nations the IMF studied, and in nearly half of those cases the deficit increase came despite a decline in investment, an indication that the debt was not being put to productive use economically. As a result it is becoming increasingly likely that more poor countries will face a debt crisis, the IMF staff paper said. IMF board members have expressed “serious concern” about the debt build-up and concluded that there was an “urgent need for fiscal prudence and improved debt management”, the organisation said. At the same time, historic methods of resolving sovereign debt crises, such as the Paris Club forum for wealthy creditor nations, are becoming more difficult, given an increasing proportion of low-income countries’ debt is bought by other types of investors, according to the researchers. The IMF, which historically has often taken the lead in dealing with such crises, expressed its concern that this development could undermine the role of western-oriented institutions in resolving such problems in the future. The diminished role of traditional creditor forums comes as buoyant debt markets have eased borrowing conditions for low-income countries. Strong investor demand for emerging economies’ debt — fuelled by a hunt for yield — has attracted countries that have rarely, if ever, issued bonds in the recent past, such as Tajikistan and Iraq. The riskiest countries are selling debt at record rates, and sales of long-dated debt are also at record levels. “Larger shares of public debt [are] being held by non-Paris Club official bilateral creditors, by foreign commercial creditors, and by domestic creditors, mainly banks,” said Sean Nolan, IMF deputy director of strategy, policy and review. Although the IMF did not mention specific examples, Russia’s deal in November to restructure $3bn of Venezuela’s debt allowed the oil-rich South American nation to sidestep major western creditors. Both Russia, which is a member of the Paris Club, and China, which is not, are emerging as alternative venues for embattled countries seeking to avoid debt restructuring managed by traditional economic powers such as the US and western Europe. The IMF report called on lenders to “work with existing international fora for creditor information-sharing and co-ordination”.“Greater transparency on the scale and terms of lending is needed,” it said. The increasing bond market activity of low-income countries has pushed up the amount they spend on servicing their debts. Developing countries’ debt payments increased 60 per cent in the three years to 2017, according to research published last week by the Jubilee Debt Campaign, which lobbies for debt forgiveness in emerging markets. The external debt payments made by 126 developing countries rose from 6.7 per cent of government revenues in 2014 to 10.7 per cent in 2017, it found. Late last Friday, with the approaching weekend ensuring the White House minimal media coverage of the move, U.S. President Donald Trump quietly signed bipartisan legislation that permits high-level exchanges between senior U.S. and Taiwanese government officials. Its passage comes three months after Congress, amid intense pressure from Beijing, watered down part of the U.S. National Defense Authorization Act that would require U.S. Navy warships to conduct regular port calls in Taiwan. Of course, the signing of the act – a move Chinese state media in February warned would cross a “red line” and cause immeasurable damage to Sino-U.S. ties – did not escape Beijing’s notice. This week, in an uncharacteristically fiery speech, China’s newly crowned president-for-life Xi Jinping said, “All acts and tricks to split the motherland are doomed to failure and will be condemned by the people and punished by history.” The following day, China’s lone aircraft carrier sailed through the Taiwan Strait for the third time in the past year. Many U.S. presidents have sought to walk a fine line between supporting Taiwan and catering to Beijing’s sensitivities over what it views as a renegade province, and China has rarely followed through on its threats of retaliation. The difference now is that both sides are beginning to acknowledge that the Sino-U.S. diplomatic dance over Taiwan has outlasted the strategic environment in which it began. And Taiwan is taking little comfort in the strategic paradigm on the horizon. The awkward Sino-U.S. detente over Taiwan has held since former President Richard Nixon’s landmark trip to China in 1972, which led to the normalization of ties between the two sides. At the time, Chinese and U.S. strategic interests were converging. The U.S. wanted China to stop meddling in Vietnam and, more important, to cooperate against the Soviets. China, which had fought a major battle with the Russians along the Siberian border a decade earlier and feared additional attacks, was inclined to coordinate with Washington against the Soviets. But Beijing needed political cover on Taiwan. And since China was too weak to retake Taiwan by force – and since Beijing was demanding few substantive changes to U.S.-Taiwanese defense or trade ties – Washington was happy to formally adopt Beijing’s “one China” policy in exchange. The U.S. closed its embassy in Taiwan and reopened it as the American Institute in Taiwan, a nongovernmental organization that happened to be manned by U.S. diplomats. Since then, the strategic logic of the original agreement on Taiwan has been gradually eroding. The Soviet Union collapsed, the U.S. lost much of its interest in Indochina, and Vietnam – still nominally a communist state but one long at odds with Beijing – began a cautious pivot toward Washington. The U.S. has, in most ways, continued to engage with China to discourage its rise from disrupting the established order in the Indo-Pacific and has generally been happy to preserve the status quo regarding Taiwan. Although it has provoked occasional Chinese bellowing about, for example, arms sales to Taiwan, sometimes even leading to temporary freezes in U.S.-Chinese military cooperation, the U.S. has mostly tiptoed around Chinese sensitivities about the island, with Taiwan routinely taking a back seat to more pressing bilateral issues. For its part, Beijing has remained content with the status quo as well, so long as Taiwan doesn’t make a major push for independence or serve as a sort of “unsinkable aircraft carrier” for a foreign power keen to check China’s rise. The strategic environment is continuing to evolve – and, broadly speaking, in ways that are not in Taiwan’s favor. China has become more assertive about securing its interests in its near abroad and its breakneck military modernization is making it better equipped to do so. At the same time, China’s growing economic clout is allowing it to cultivate substantial political influence among its poorer neighbors, while contributing to political crises in the West. As a result, the U.S. and its regional allies are becoming more overt about the need to lay the groundwork to contain China, should matters come to a head with Beijing, and therefore less inclined to pretend to bend to Chinese wishes on matters like Taiwan. On the surface, this would seem to be a welcome development for Taipei, to the extent that it removes political and strategic constraints on Washington’s support for the Taiwanese. But Taiwan is still drifting into uneasy waters. It fears being treated like a bargaining chip or, worse, becoming a battleground between China and the U.S. in a war not of its choosing. More problematic, Taipei still has ample reason to question the level of U.S. commitment to its defense, even if the U.S. abandoned the “one China” principle altogether. China is still far from having the navy needed to go toe-to-toe with the U.S. in open waters, but it is developing the capabilities to make it increasingly costly for the U.S. to go to battle closer to the mainland. The U.S. disinterest in starting a conflict over China’s island-building in the South China Sea has exposed the distance between U.S. strategic priorities and those of Southeast Asian states. The U.S. inability to dictate terms on the Korean Peninsula has revealed the limits of its power even on issues vital to U.S. strategy. The U.S. is an ocean away, and Taiwan cannot be certain that regional circumstances will not shift further and eventually give Beijing an opening to force the issue. And in this regard, Beijing thinks time is on its side. Can China Win Without Fighting? Reunification is Beijing’s utmost strategic and political priority. This view is, in part, motivated by domestic concerns. Under Xi, China is putting the finishing touches on its reintegration of Hong Kong and Macau, the two other physical reminders of China’s century of humiliation and foreign subjugation. Taiwan is a perpetual scar on the Communist Party’s narratives about the communist victory in the Chinese civil war, and the party routinely nurtures grievances about foreign meddling in Taipei to curry nationalist support for its right to rule. This view is also strategic. So long as the U.S. can pair its superior naval and aerial capabilities with bases and allied support along what’s known as the first island chain – Japan, Taiwan, the Philippines and Indonesia – it poses a threat to block sea lanes that are critical to China’s export-dependent economy. And more than any other island in this chain, Taiwan could be used by a foreign power to threaten the Chinese mainland itself. Retaking Taiwan would blow a massive hole in the U.S. containment strategy – and put China in a more enviable position to threaten Japan. For Beijing, therefore, reunification is a matter of when, not if. This doesn’t mean it will attempt to retake the island anytime soon. Attempting to do so would involve vast amphibious landing operations against a well-equipped and deeply entrenched foe, requiring extraordinarily complex coordination between air, land and sea forces, and especially with logistics. The Chinese military has no real experience with this kind of warfare. It would also expose economically invaluable mainland regions to Taiwan’s considerable firepower. For the time being, China is following Sun Tzu’s tried and true strategy of winning without fighting. In recent years, especially since the 2016 electoral win of Taiwanese President Tsai Ing-wen’s nominally pro-independence Democratic Progressive Party, China has doubled down on efforts to squeeze Taiwan diplomatically. For example, it’s been flooding the few remaining countries that still recognize Taipei as the legitimate Chinese government with aid and investment in exchange for severing ties with the Taiwanese. Taiwan has found itself barred from international bodies like the World Health Organization, the International Civil Aviation Organization and Interpol. Chinese diplomatic pressure has succeeded in diminishing Taiwanese trade ties with important partners such as Nigeria. These moves may be little more than irritants to Taipei, but they speak to the potential that China can suffocate Taiwan internationally in more substantive ways. Already, for example, Taiwan has been unable to find sellers to help it update its obsolete and minuscule submarine fleet – a critical vulnerability for a country separated by just 80 miles (130 kilometers) of water from a military perpetually planning for an invasion. The overriding goal of this strategy is to make it easier for Taiwan to one day decide that peaceful reunification is in its own best interests. The ongoing shift in the military balance of power toward Beijing, combined with Taiwanese doubts about U.S. commitments, certainly gives it reason to think Taipei will eventually come around. So too is Taiwan’s eroding economic edge, as mainland firms increasingly move into the high-tech and advanced manufacturing spaces occupied by their Taiwanese counterparts. And moves like the announcement by Beijing’s Taiwan Affairs Office in February of a list of “31 incentives” to “improve the rights of Taiwanese studying, working, living or starting a business” on the mainland are intended to hollow out resistance from within. In theory, China can afford to bide its time to see if this strategy works. As former paramount leader Deng Xiaoping put it, China can wait on reunification for 100 years if necessary. The question is what happens if and when China plunges into a deep socio-economic crisis, hindering both China’s military trajectory and its ability win over the Taiwanese with soft power – and whether nationalist pressures in such a scenario compel China to take its best shot prematurely.